Apple Pay's online payment capability from within apps will be expanded to the new iPad Air 2 and iPad mini 3 when both become available next week. The in-store payment capability will also work with the Apple Watch when it ships next year. Apple announced the mobile payment launch in a streamed online presentation Thursday, listing 35 US retail brands where a user can make in-store payments by year's end. Stores including Whole Foods, Macy's, McDonald's, Duane Reed, Texaco and others. Apple Pay is reachable from within the Passport app in Apple devices and is enabled by iOS 8.1, a free software update to iOS 8 that will be released Monday. In addition to those stores, Apple listed 23 store brands accepting online payments with Apple Pay, including Staples and even Starbucks, which today relies upon QR reader technology, not NFC, for in-store payments to buy coffee. In one of the curious twists with Apple Pay, Starbucks customers will be able to load money from a credit card already stored in an iPhone 6 or iPhone 6 Plus onto a Starbucks card stored in the phone and then use the Starbucks card to buy coffee at a Starbucks terminal equipped with a QR scanner. "We believe Apple Pay is going to be huge," Apple CEO Tim Cook said in his presentation, ignoring the difficulties faced by previous mobile wallet schemes, including Google Wallet and Softcard, formerly known as Isis. "It's going to change the way we pay for things. The journey begins [Monday] and we can't wait." Apple Pay uses Near Field Communication chips inside the phones that are read by NFC readers available in an estimated 220,000 stores nationwide; a user just passes the phone close to a terminal while holding the Touch ID. "A subtle vibration and beep let you know" when a purchase is done, Apple advises in an online explainer accompanied by a video snippet. Apple Pay also relies on new token technology that is backed by MasterCard and Visa to secure either in-store or online transactions along with the Touch ID: both features work together for better security and were hailed by analysts as unique and groundbreaking. Apple supports the credit and debit cards from the three major card companies -- American Express, Visa and MasterCard. In addition, more than 500 banks are backing Apple Pay, though Apple named just a few: Chase, Capital One, Bank of America, Citi, Wells Fargo, US Bank, Barclaycard, PNC, USAA, Navy Federal Credit Union and American Express. Those banks represent 83% of all credit card purchasing in the U.S. Despite a seemingly robust rollout, analysts criticized the relatively scant number of retailers on board, saying users might be frustrated in finding enough stores to make buying goods with a mobile wallet a habit. 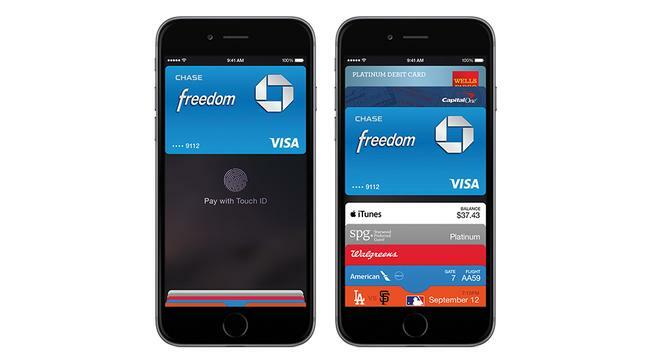 Analysts said Apple Pay users will surely try out the in-store payment technology once or twice. But will they come back repeatedly? In all, analysts predicted that Apple Pay will purportedly work in about 220,000 brick and mortar stores in the U.S. -- just 5% of all available stores. "That's a good number of stores, but in the scheme of things, that's just 5% of all merchants," said Peter Olynick, card and payments lead at financial services consultancy Carlisle & Galligher Consulting Group. He estimated it will take 10 times as many store locations to make Apple Pay effective. "We'll see where they are after people use it a few times, and if it's as easy to use as we think it will be -- and if they can increase the number of merchants from 200,000 to 2 million in a year, then we'll have something," Olynick said. Having more than 500 banks backing Apple Pay isn't necessarily going to mean much with such a limited number of retailers, said analyst Jordan McKee of 451 Research. "It's good that Apple has a lot of banks lined up, but it's where the consumers can use those cards that matters and Apple really hasn't done much on the payment piece," McKee said. "They haven't focused on the merchant, and many of the merchants they named were already accepting contactless [NFC] payments. They have to build out a two-sided value proposition." In his presentation and when Apple Pay was announced more than a month ago, Cook focused on the quick and secure ability to make a payment once a person's credit card is loaded into the phone. A user can use the phone's camera to capture an existing card's information, or can type in the information manually. Users can also rely on the credit or debit card already in an iTunes account as the default, assuming it is Visa, MasterCard or American Express. A person's account information, including the 16-digit card number, is not stored on the phone or with the merchant, according to the credit card companies and Apple. Instead, token technology allows a unique digital Device Account Number to be generated that becomes a proxy for the primary card number, and that Device Account Number is then used in payments. If a phone is lost or stolen, the Device Account Number can be disabled without needing to reissue the primary card. The Device Account Number helps keep each payment private, so that only a consumer's bank has access to billing details. The number is created, encrypted and stored in what's known as the Secure Element (usually a separate chip in a phone), which Apple insisted is "walled off from iOS and not backed up to the iCloud." Even though Apple has tightened security more than other digital wallet technologies, analysts said many users will still be skeptical about security with Apple Pay. Olynick said Apple's approach is more secure than cash, credit cards and other mobile wallet technologies. "There's inherent security concerns with every form of payment," he said. Despite those worries, Carlisle has surveyed the public and found 45% have indicated an interest in using mobile wallet. "People are open to the idea." One thing that will matter to users, perhaps more than security, is how much easier using Apple Pay will be than pulling out a credit card or even paying cash, which is still fairly popular in the U.S. "It's not that hard to pull out a piece of plastic from your wallet, so until I can leave my wallet at home and not need identity cards and can get rewards from using a mobile wallet or get something more, the possibilities [of Apple Pay] aren't shown yet," he said. Carlisle has rated 20 different mobile wallets now on the market for the mobile payment technology and capabilities they use as well as the user experience they offer. When Apple Pay was included, it came out nearly on top, right up with the mobile wallet apps from Starbucks, Square, PayPal and Level Up. McKee said that Apple Pay has a clear advantage over what Google Wallet offered when it appeared nearly three years ago: more assurances of privacy. Merchants and users were not sure how much personal or transaction data Google was collecting when a Google Wallet transaction was made. By comparison, Apple has insisted it won't be collecting any such information, noting in a statement that "Apple won't collect your purchase history, so when you are shopping in a store or restaurant we don't know what you bought, where you bought it or how much you paid for it." "Google was early to the party with Google Wallet and Google being Google, everything was about collecting data, which was a real turn-off to merchants especially," McKee said. "Apple is not interested in data or obtaining that information on transactions and has made that very clear, which reduces the concerns of merchants." Given the competition and Apple's focus on consumer ease in using technology, Patrick Moorhead, an analyst at Moor Insights & Strategy, said that Apple Pay has the "best chance of success of the current players" even though mobile wallet technologies have taken years to gain traction. "Apple Pay is more secure, easier and protects a user's privacy more than the current solutions," he added. "It also spans online and brick-and-mortar stores, which will increase points of purchase -- critical for success. Previous marketing efforts for NFC payments have been confusing, actually repelling users. Apple knows how to educate." Assuming there are no major technology snafus with Monday's launch of Apple Pay, users will need to see how much ease the technology actually offers.